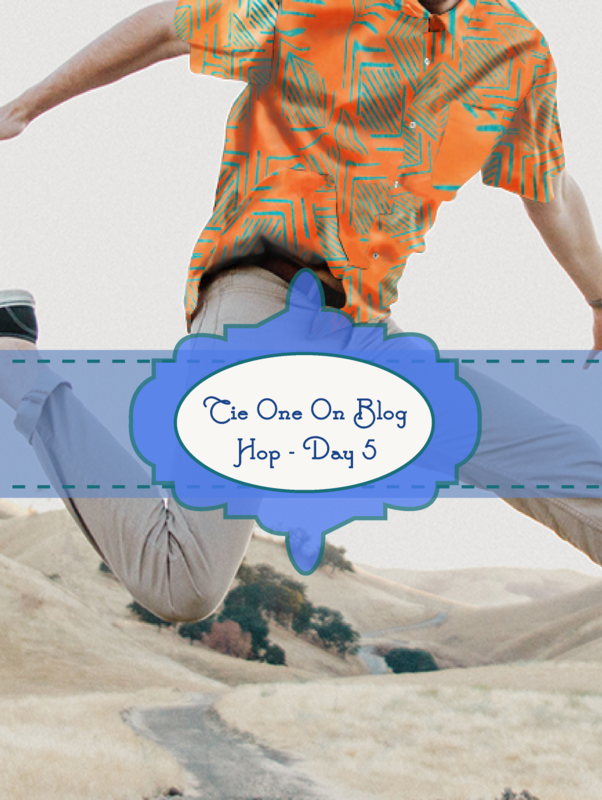 We are now at the halfway point – Tie One On Blog Hop Day 5. I hope you have enjoyed meeting the “Hoppers” and seeing what fun stuff they have been up to. Soon You will be able to play with Tie One On too! I cannot wait to see what you make with it; I know it will be amazing!! Today’s Hopper(s) are Linda and Carl Sullivan, better known as the dynamic duo behind Colourwerx! 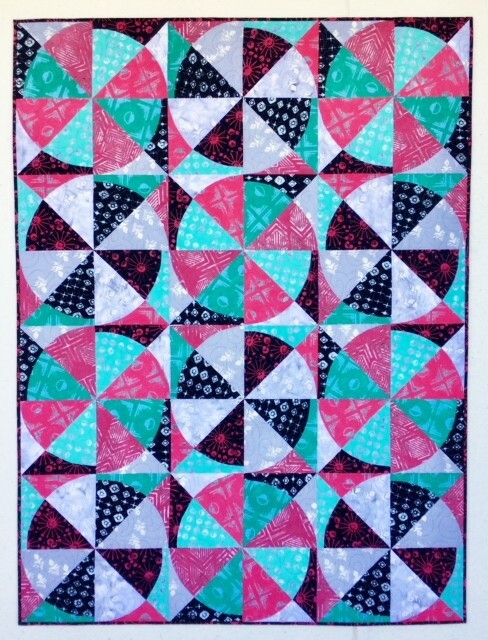 They have come up with this amazing quilt pattern called Whirligig (coming out in a few weeks- hmm…same time as the fabric!) Linda decided to work it up in Tie One On with the Ventura colorway and the black and white piece from the Manhattan colorway. Isn’t it grand!? I really like how these colors give a very hip sort of Modern Christmas feel without being confined to just one time of year. I actually didn’t plan that when I was working on the colors of this line. It just sort of happened. That is pretty much how I plan my quilts, so I guess it makes sense! Go check out their blog post for more details about Whirligig and be sure to comment there for a chance to win the Banyan Prize as well as the pattern prize that they are giving away as well. Flashback to Spring Quilt Market (and Greener grass)…. 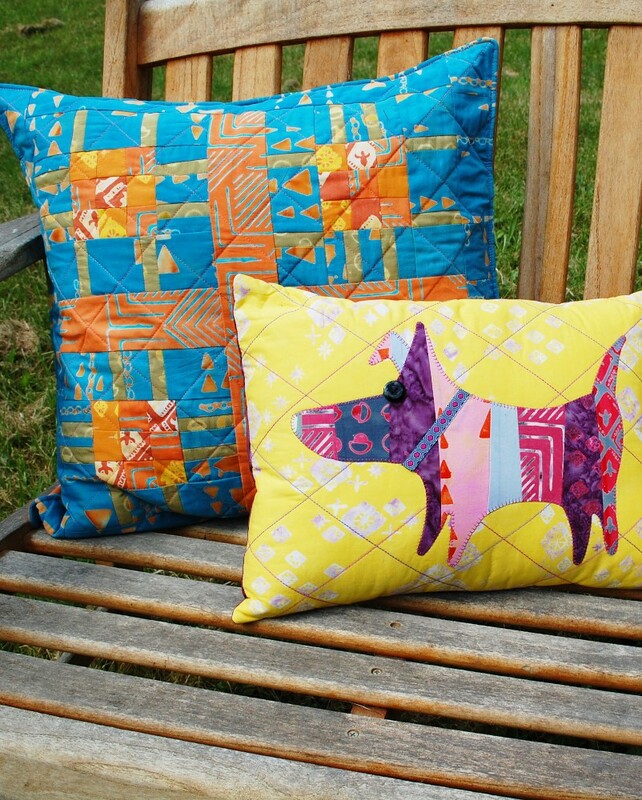 Carl and Linda made these great Mini Mod Dog pillows too. Very well done and ultra swanky. Flanking the Mini Mod Dogs are two pillow covers created by my friend Melissa Thompson-Maher using my Soup of The Day Quilt block. She did an amazing job on them. I love how she paired the purple with the pink and grey. Not sure that I would have done that , but I love the look she created! Also from Spring Quilt Market, we had more bags made by good friends. 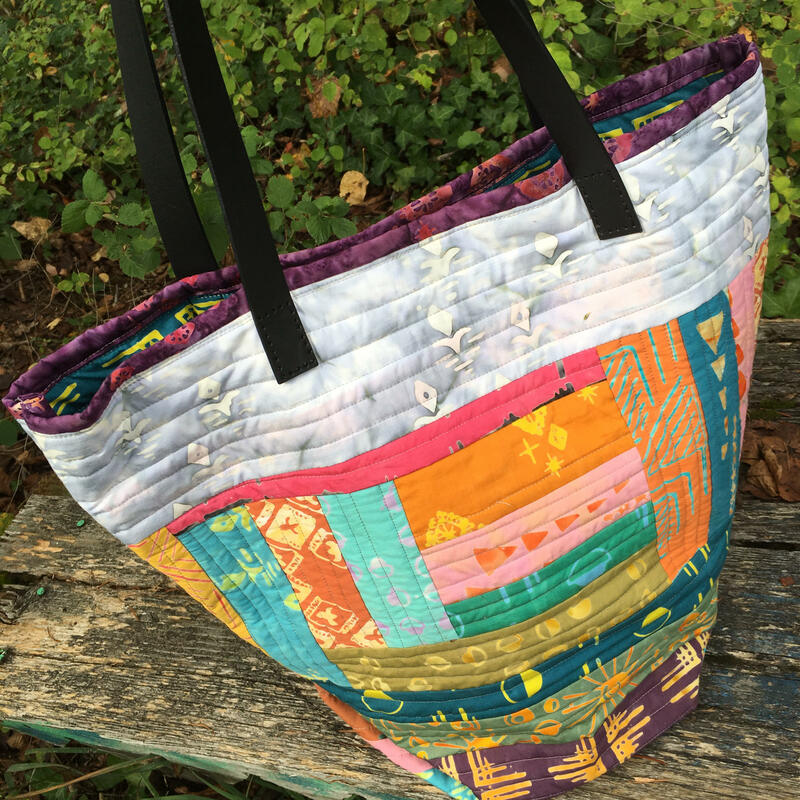 This Bucket Bag is by my friend Natalie Barnes over at Beyond the Reef Patterns. First photo is a dark dramatic shot showing my first ever attempt at crochet (well, after my failed attempt at 8 years old). And a fully lit shot showing the fabric and bag in a more direct light (perched on top of some Tie One On pillows). This bag is great because it has a really flat bottom! That’s it for today, folks! Hope you are having a great time and commenting on everyone’s posts for chances to win!! 9/26 – Linda Sullivan — That’s TODAY! 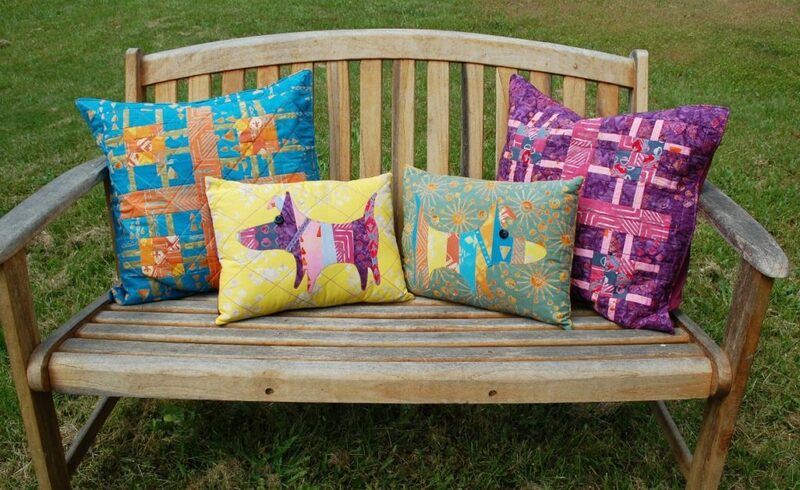 Those pillows look great in your fabric! I think the purple looks great with the grey and pink on that pillow. Again, I love the variety of samples you’re sharing! Such delicious colors in your new line of fabric. Love the puppy pillows! So cute! I love those puppy pillows! The Whirligig does have that Christmas vibe, candy discs are what I see! Very nice pattern and display of the fabrics! Linda’s quilt looks beautiful. Her pattern and the fabrics she used makes it look like it is swirling. She did a wonderful job. I love the bags, especially the last one. 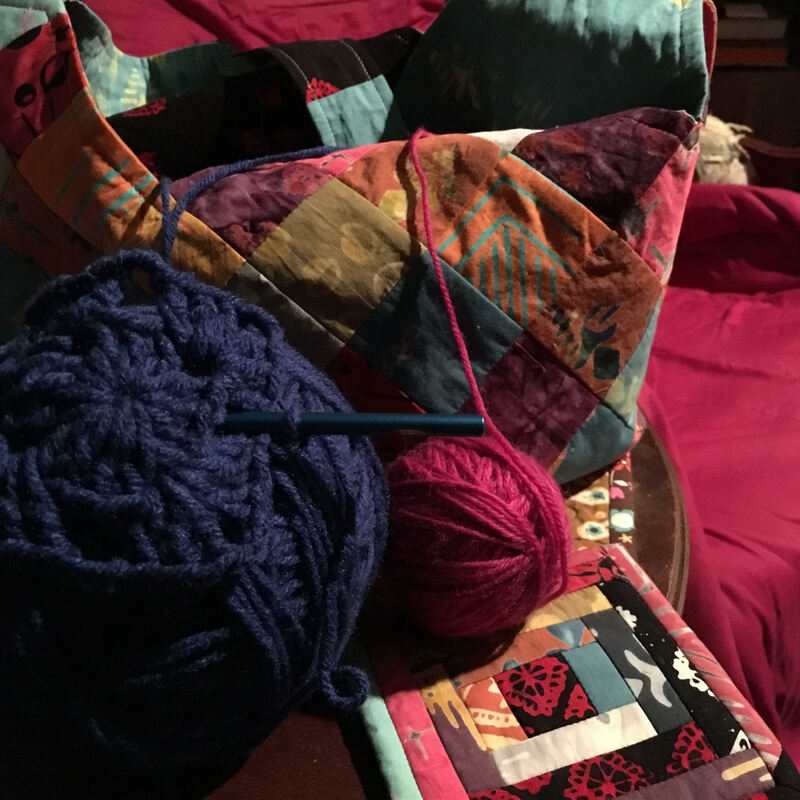 Enjoyed all the photos, The bucket bag looks like great fun, the whirligig quilt could be different looking in every color way. Actually had to take a second look at the doggie pillows. They are so darned cute! Wow, such a lot of eye candy! 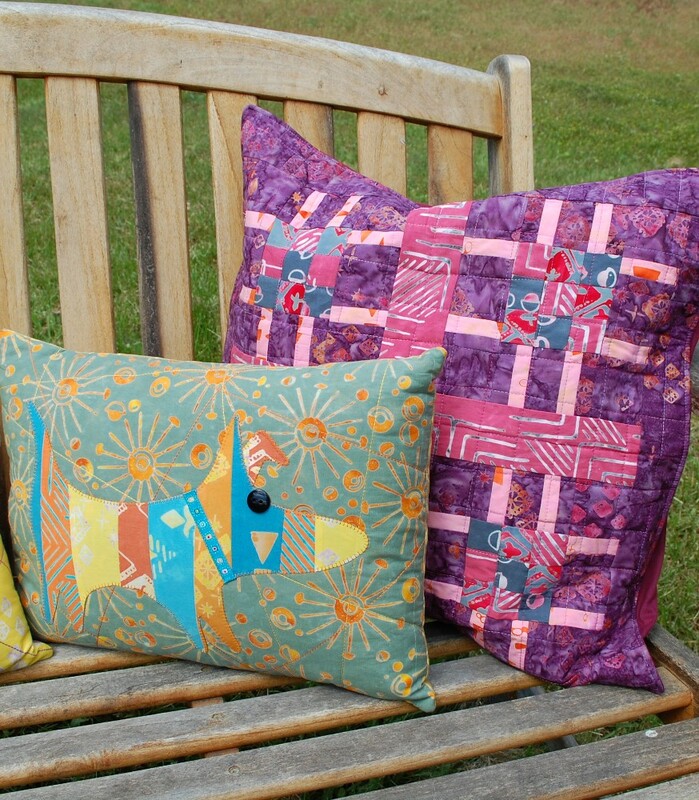 Your gorgeous fabrics have turned into so many wonderful projects! I’m enjoying the blog tour and seeing all the items made in your fabric. 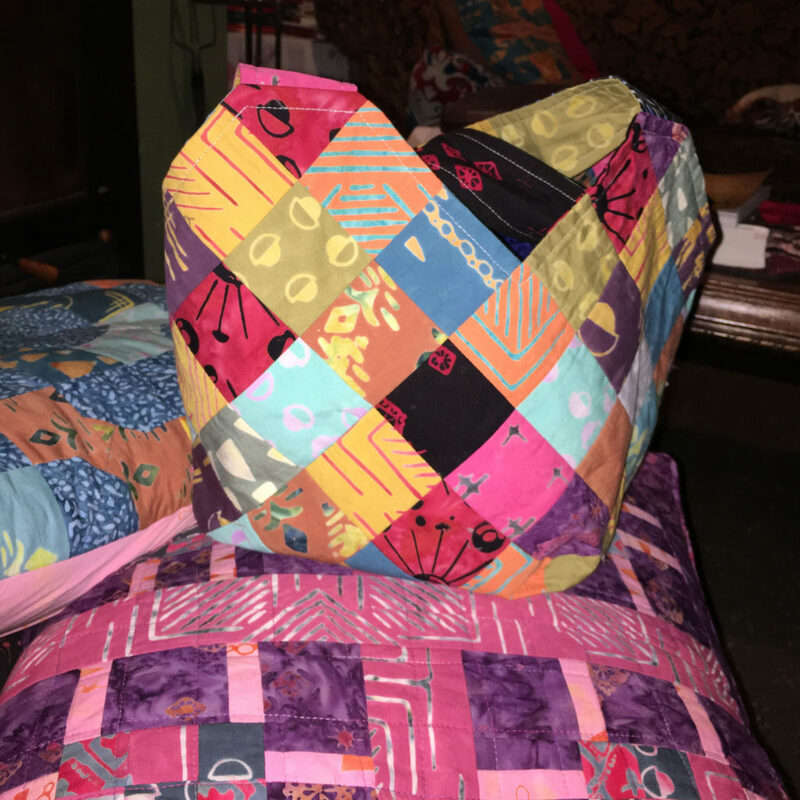 Awesome blog hop – love those batiks! Love Linda pinwheels, very nice.